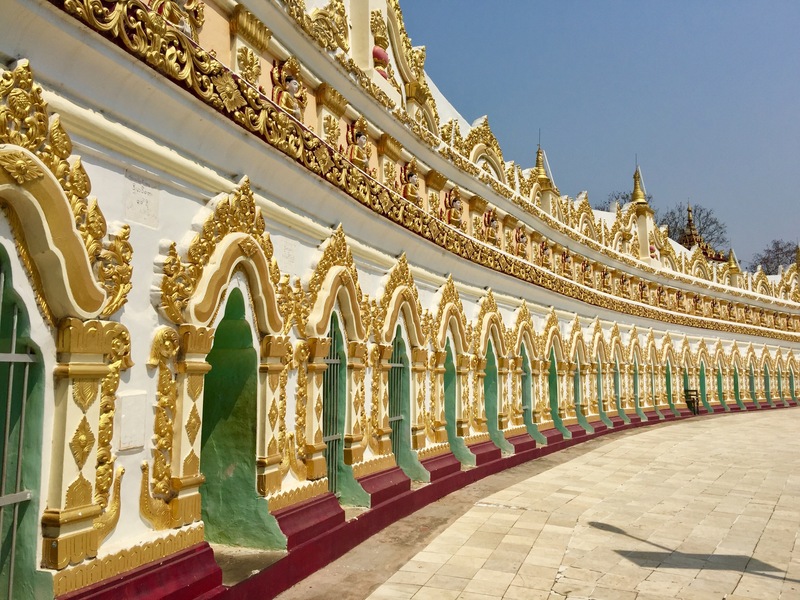 We enjoyed a 12 minute flight from Bagan to Mandalay, the shortest we’d ever taken. There was only enough time for the flight crew to hand out some sweets to the 68 passengers. 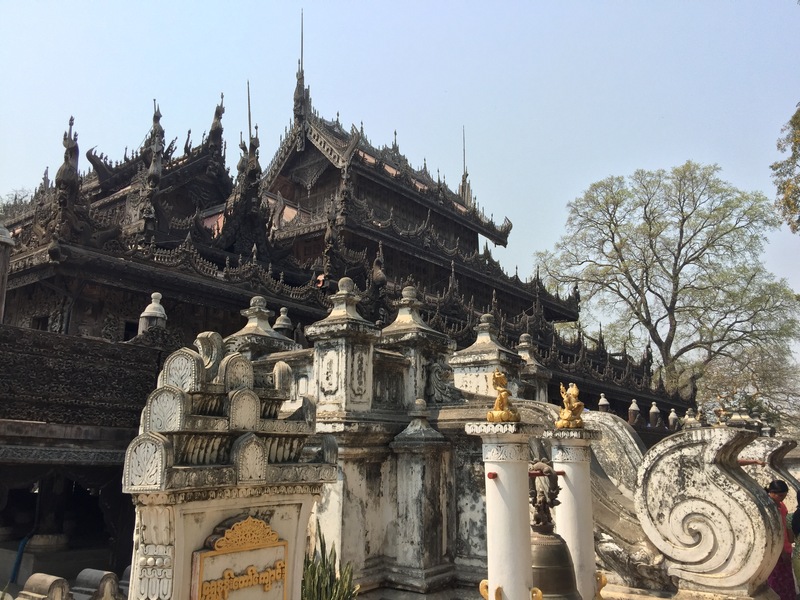 Our guide and driver were waiting and we set out for our day sight seeing around this central Myanmar city. Our first stop was a very busy and popular temple Mahamuni Temple. Our driver drove the wrong way down the road and caused a traffic jam so we got out and walked the last 500m. 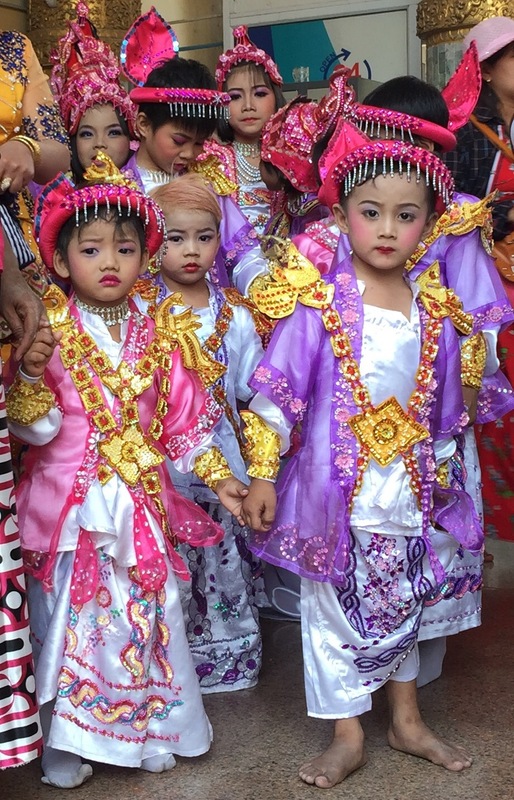 Being a Saturday and a religiously significant time of year, there were many initiation ceremonies going on – this time however with many more children and families and no elephants. Nevertheless it was still quite the spectacle as they all shimmied around the temple in their colourful initiation outfits. One thing still stood out however, the unhappy look on all their faces, especially the girls with their long silky black hair- ready to be shaved the following day. While at the temple, we also got to queue and place some good leaf on a giant Buddha, for good luck and prosperity. As this happens everyday, the Buddha was beginning to look rather more lumpy than smooth so had an odd appearance. Next we visited an old teak palace. Unlike the one we saw in Bagan this one we could walk on and in. After some confusion with our guide (who thought we had to pay, but we had already paid as an all inclusive package) we entered and the musty old smell and the creaking floor boards made quite an atmosphere and surprisingly it was much cooler than the outside heat. 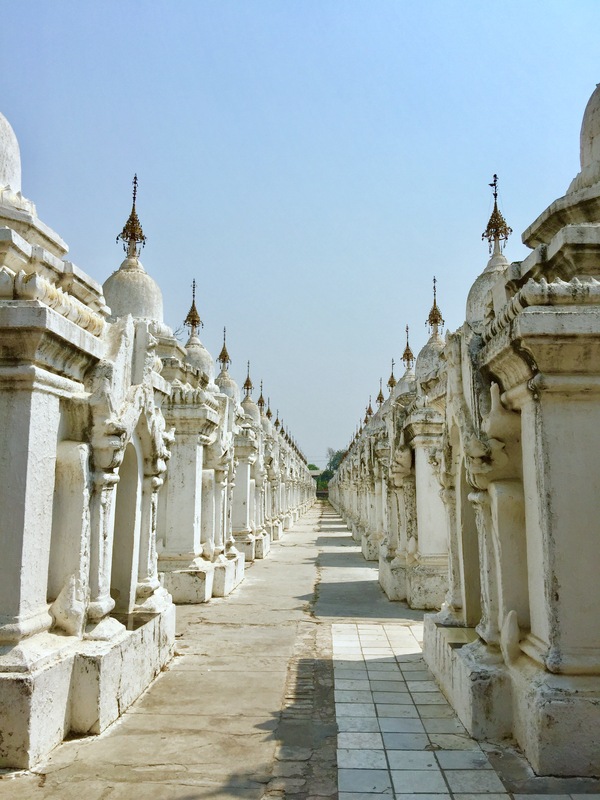 Next we visited a temple, not special invites elf but for the 700 hundred small white temples that surrounded it housing the worlds biggest book. Each one had a marble slab inside, with the text written in tiny writing in an ancient language. After being followed by a stray cat and taking photos of the long parades of temples we moved on. It was approaching lunch time and both of us were hungry, but we carried on to the next stop across the river. Crossing the impressive bridge we arrived at a Pagoda carved into the mountain with 50 doors were carved and inside was a long curved corridor with 50 Buddhas. It made for a nice sweeping photo. After losing Mike and the guide we reunited and took a short drive down to the river, where we crossed on a small rickety boat to an island where the local transport was horse and cart. First however we had a much needed lunch before rattling off on our bumpy trip around the island. We passed many Pagodas and ruined temples and palaces. Many had been destroyed in old and recent earthquakes. The horse (called La) and cart made for an interesting experience along the bumpy dirt roads. We saw another Teak Palace, which I’d imagine in a few years will not be standing, due to wear and tear and the monsoon rains completely cutting it off and rising up the wooden stilts. The building had some impressive carving work and clearly in its day would of been stunning. After another bumpy ride we stopped at a ruined temple complex. 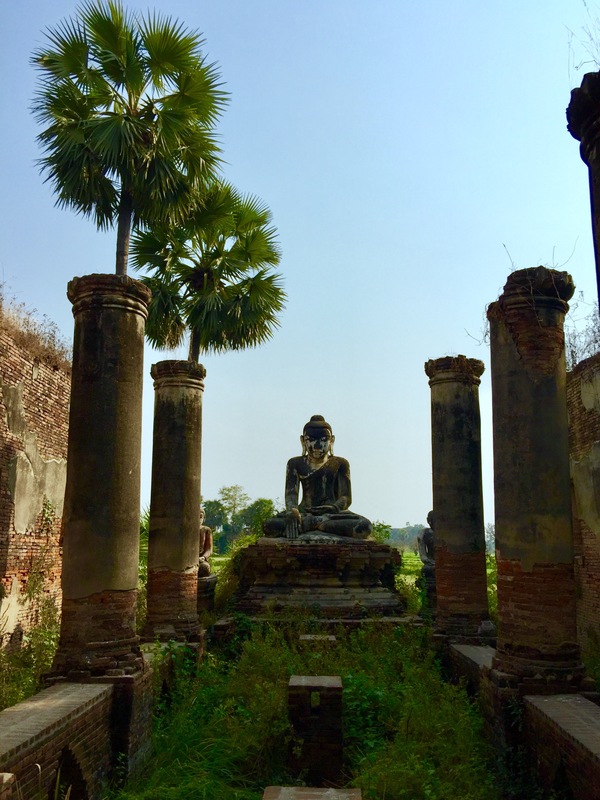 Here climbing through the ruins was a stunning old Buddha left to erode amongst some columns and beautiful lush green countryside. Our cart continued and we passed through another old Palace and temple area. An old royal swimming pool lay over grown and a watch tower almost completely on its side made nice photos. 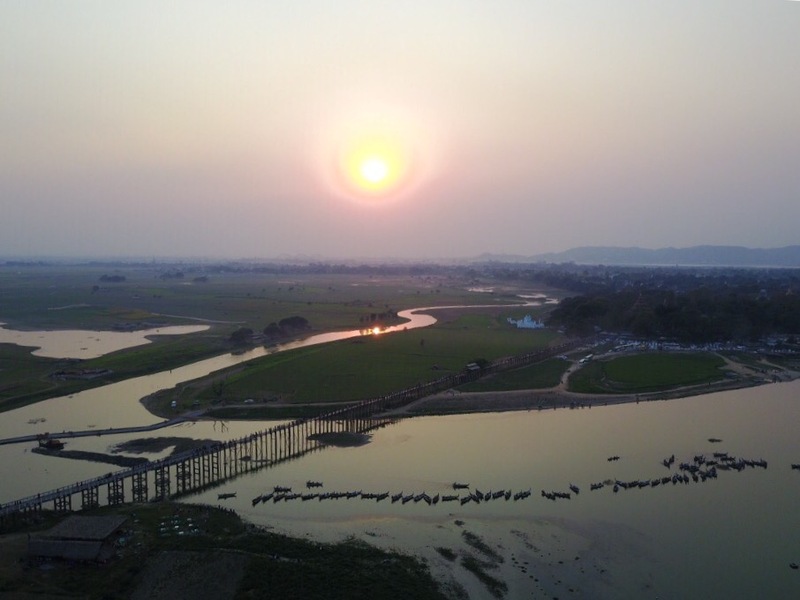 La took us back to the boat and after the short trip we were back in our car and heading back into town to Mandlay’s longest teak bridge – U Bein Bridge. Built in 1850 and is 1.2km long it links to an island in the middle of the lake. While much has now been replaced or repaired it is still a stunnjng spectacle. Mike flew the drone while I walked the bridge with the guide (and the mosquito’s). Many boats below lined up for the sunset and even several hundred ducks swam their way home as the sunset across the horizon. Sunset over we headed to our hotel for the night as tomorrow we were heading back to Yangon for more sightseeing and our late night flight to Beijing.